Meditation Classes in Burlington, Ontario. Many years ago, when I was quite young and still in grade school, I used to spend a lot of time gazing out the tall classroom windows. With my teacher’s voice somewhere in the distant background and my brain in daydream mode, time seemed to fly by. Although it often got me into trouble with my teachers, daydreaming was one of my favourite things to do. I always came out of a daydream feeling refreshed and happy and more alert than ever. Over the years, amidst raising children, working on a career, and just general living day to day, I seemed to lose my ability to daydream. My mind was always such a flurry of worries and thoughts that it seemed quieting it down long enough to let it go blank in the middle of the day was one of the skills that fell under the ‘use it or lose it’ category. I, for one, had lost it. research into meditation and was intrigued to learn that the regular practice of meditation actually alters the brain in a very positive way. The benefits of meditation not only fell within the realm of increased mental health. ; they extended much deeper into the scope of increased physical health and disease reduction. With so many healthful benefits, I decided that once Chrysalis Yoga Studio opened, I would begin to take meditation classes regularly. 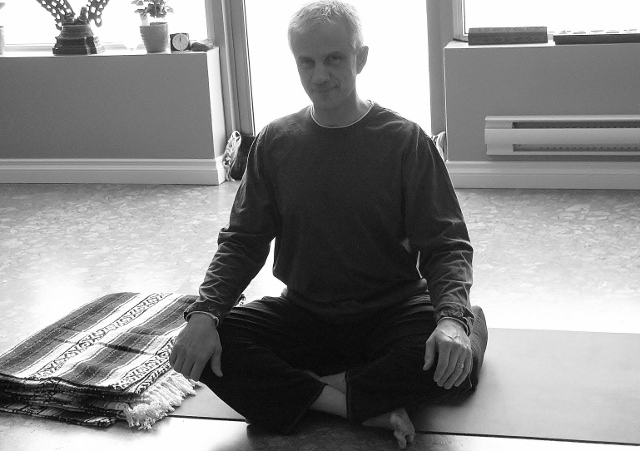 Clayton teaches a meditation class at Chrysalis Yoga Studio in Burlington every Wednesday at 5:15. It was after my second class, feeling refreshed and stress-free, that it occurred to me I hadn’t daydreamed in many years and meditation seemed to feel strangely familiar to my state of mind. During the subsequent week, when taking a break from a busy day, I would try to daydream. I seemed to have lost the ability and quietly thought to myself that perhaps learning to meditate would bring that ability back to me. I knew that research had shown daydreaming, which enables the brain to enter the Alpha Wave zone, to be very good for enhancing creativity and problem solving skills. Researching a bit further, I learned that light meditation also causes the brain to show Alpha Wave activity. Perhaps I’d hit upon the key to re-teaching myself to daydream! After my 4th meditation class with Clayton, I felt particularly clear-headed and rested. The myriad of thoughts and worries that often raced around my brain were non-existent and I felt a sense of freedom and lightness. That afternoon, as I sat taking a moment’s rest from the work I had been doing, I turned my gaze and looked at the top branches of a distant tree. A flock of birds had congregated on the most distal tips of the branches. As I sat watching them, I felt a sense of elation as my brain transitioned into the old familiar daydream state; a state of blissfulness, rest and lightness. Coming out of of daydreaming state, I thought of Clayton and that day’s meditation class. I felt a deep sense of gratitude to Clayton. His meditation classes and his talent for teaching meditation were beginning to take effect on my brain waves and, as a new sense of calm overtook me, I began to imagine the possibilities that meditation holds for enhancing all areas of a person’s life. If you’re wondering about meditation classes in Burlington, drop by to Chrysalis Yoga Studio on Walker’s Line and Palladium (just north of Dundas) at 5:15pm on Wednesday’s for a meditation class with Clayton Smith. You’ll be glad you did. 113th Annual Audubon Christmas Bird Count Begins Tomorrow!